We’re back again at Bistro Bohem for Jazz Night, Sunday, November 3, from 8 to 10 p.m. Joining me will be George Oakley (reeds and woodwinds), Ethan Foote, (bass) and Nick Lipkowski (guitar). We’ll be playing Great American Songbook standards and maybe a few other surprises. Bistro Bohem features Central European food (primarily Czech) and great beers from the region. Click here to see the full menu. The restaurant is at 600 Florida Ave NW, Washington, D.C. Phone: 202.735.5895. No cover charge. Also, I’ll be at the Black Fox Lounge in DuPont Circle in Washington, on Wednesday, November 6, 8 to 11 p.m., with Oren Levine on keys and possibly a bass player (still working on that). Come on out to one or both of these shows. It will be great to see you. How will you be spending the final hours before the U.S. Government defaults on its debts? Watching Wolf Blitzer and the “Best Damn Political Team in the Solar System”(TM) search for new ways to describe the crisis, as the countdown clock ticks away in the corner of the screen? Taking inventory of skids of canned foods you’ve stored in your basement? Refreshing every 90 seconds the browser showing your how fast your stock portfolio is losing value? Re-reading “The Road” by Cormac McCarthy (as depicted in the photo above), just to acclimate yourself with what you might be facing in the near future? Friends, I have a better option. Join me and jazz pianist Oren Levine at the Black Fox Lounge, 1723 Connecticut Ave, NW, Washington, D.C., on Wednesday, October 16, 8 to 11 p.m., only moments before the debt ceiling deadline. Look at it this way, if we all going down, why not go down together? So come by on October 16 for a bite and some drink. Oren and I will be on the main level of the Black Fox, right in the window as you come off the street. This is the first of a regular series of engagements there, every first and third Wednesday of each month. And don’t forget to join me at Bistro Bohem on Sunday, November 3, 8 to 10 p.m. More on that later. I’ll be keeping busy these next few weeks at both the Black Fox Lounge and Bistro Bohem. On Wednesday, October 16, 8 to 11 p.m., and then again on Wednesday, November 6 (same time), I’ll be at the Black Fox (pictured below) with Oren Levine on piano. We’ll be in the front window of the place, so you won’t miss us when you come in. No cover, and the usual Great American Songbook (and more) material. 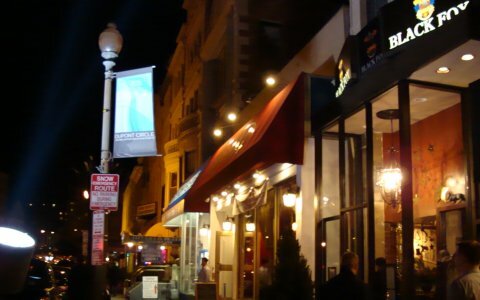 Black Fox is at 1723 Connecticut Ave., NW, Washington, D.C., right in the heart of DuPont Circle. This is the start of regular appearances on the first and third Wednesdays of each month. Then, on Sunday, November 3, 8 to 10 p.m,. I’ll be with George Oakley (sax, clarinet, flute), Nick Lipkowski (guitar) and a bass player to be named at Bistro Bohem, 600 Florida Ave., NW, Washington, D.C. Also, no cover. I hope to see you on all these evenings. Should be a lot of fun.